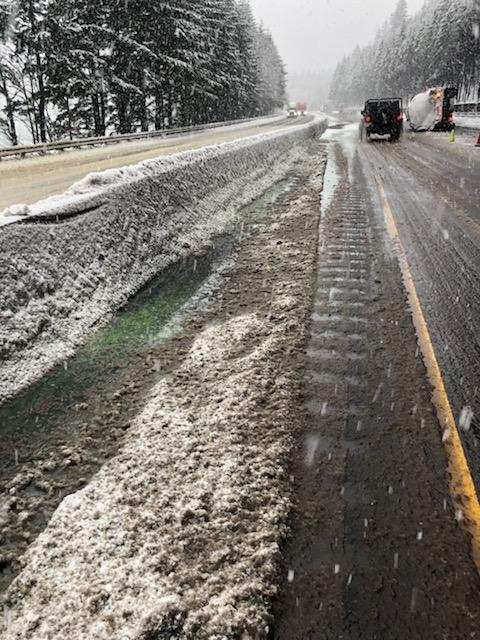 CASCADE LOCKS, Oregon — Oregon State Troopers and emergency personnel responded at about 10:30 a.m. today to a non-injury commercial motor vehicle crash which leaked approximately 2,500 gallons of diesel onto the highway. Preliminary investigation a Space Age semi-tractor pulling two tanker trucks was eastbound on I-84 near milepost 54. The driver, James Altman, age 34 from Portland, was driving too fast for the snowy conditions on the roadway. Altman lost control of the commercial motor vehicle and the tankers flipped onto their sides. When the tankers flipped they started leaking onto the diesel onto the highway. The diesel eventually seeped underneath the barrier onto the westbound lanes of travel. Two tanks completely spilled their diesel. The highway has been partially blocked since 10:30 AM. Space Age has contracted a company to clean-up the spill and tows are on scene. ODOT and OERS have been notified and are en route to assist. The highway is expected to open shortly. Check WWW.tripcheck.com for current highway conditions and closures.